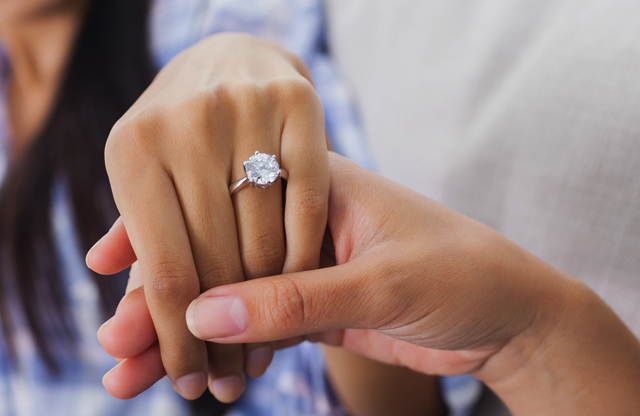 Home Fashion News How Much Should You Spend on an Engagement Ring? A girl can dream about the perfect engagement ring, but it’s back to reality once the price tag rings in. With the holiday season in full swing, December surpasses Valentine’s Day as the most popular time of year for engagements. According to Brides magazine, the average man spends about $5,229 on an engagement ring. Jewelers seem to advise hopeful fiancés to spend around three months of their salary on a rock. However, if job security or debt is a major factor, he should of course budget accordingly. Another engagement “rule” that has stood the test of time is the simple math of spending a month’s salary on a ring. This concept dates back to the Depression Era when DeBeers launched an ad campaign suggesting that men should spend one month’s salary on a diamond engagement ring as a compromise to save money during hard times. The idea has stuck almost a century later. More couples nowadays are making shopping for an engagement ring a mutual decision-making process. Though some may argue that it takes all the magic and romance out of the idea of the ring, discussing numbers before the purchase is made might be beneficial in the interim for two starting a new life together. What do you think? Is the rock on your finger the ultimate symbol of love or does love have no price?